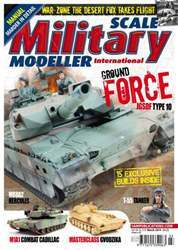 This is the fourteenth in this series sponsored by Revell, here Leigh Jones takes you step-by-step through constructing and painting their latest 1:35 Pz.Kpfw.35(t) kit, and in addition to this, you can also enter our exclusive Revell competition on page 19 to win a Pz.Kpfw.35(t), and build along with us. In this feature Tolga Dogruer shows you how to use an airbrush to add an unusual desert colour sceme to a quite eclectic tank! Michael Mandau presents another stunning diorama setting.